Here's something I've been meaning to do for a while and today is the day. Blame it on dark winter boredom, on accidentally stumbling on that dusty cardboard box in the cellar or on mid-life crisis. Whatever. Some of you out there will get it and I salute you. 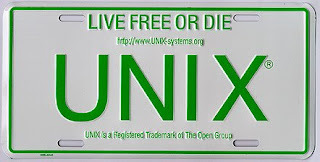 My interest in UNIX started in early 1992 while studying for my Computer Science engineering degree. Rémy Card was teaching the UNIX class, so I got a Linux system running from day 1 :) The first release I installed was 0.13, which then became 0.95 in March '92 (the first release with X Window support). I still remember downloading the floppy images from René Cougnenc's BBS (RIP friend). Shortly after, Rémy et René et myself co-wrote what it possibly the first magazine article ever published on France on Linux (available here). 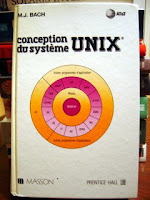 There wasn't a lot of Linux documentation at that time... and none in French. So I started writing my own guide, called "Le Guide du Rootard pour Linux (GRL)". I also translated the Linux info sheet with some help from René. For a while, these two documents were the only Linux documentation in French (here's a later post from May '94 in fr.comp.os.linux). During that time, I got to meet Linus Torvalds a few times. I also attended the 1st Linux Conference in Heidelberg in '94 and met Richard Stallman there. By then, I had started to work - which meant that I had less time - and I was also growing increasingly annoyed by the business circus surrounding Linux. In May '95, I decided to stop maintaining the GRL: here's the farewell thread in fr.comp.os.linux, with Rémy saying that I "massively contributed to Linux usage in France". That was 13 years ago. Man! 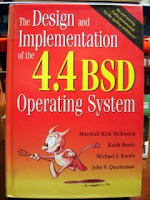 In late '96, I somehow found the time to work on a French translation of Kirk McKusick's 4.4BSD book (see below)... and I swore I would never do it again. This book consumed all my evenings (and many nights) for months. I guess having the privilege to exchange some e-mails with Kirk was worth it all! 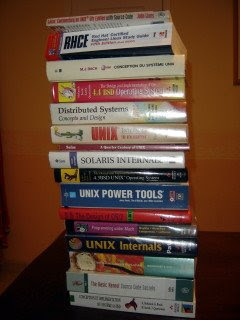 Without further ado, here's my UNIX bi(bli)ography, with a couple of other OS books thrown in for good measure. I added links to Amazon to help you buy them (no, I'm not making any money in the process). This book is a commented printout of the Unix V6 kernel code. Obviously influential... if you had a copy at the time. 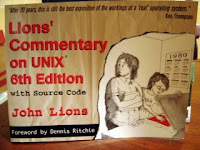 Still a great read, showing the simplicity and purity or early UNIX. And definitely nice to have for historical purposes. The first proper book on the UNIX kernel (mostly System V Release 2), covering all major topics: process management, file system, I/O, etc. Hardly any code, but lots of detailed explanations, figures and algorithms. A very good book that helped me a lot in the early days. If you were working on System V UNIX in the early nineties, this was the one to have. What can I say? To UNIX geeks, this is the Ancient Testament. The story has been told many times, but the importance of Berkeley UNIces (4.2, 4.3 & 4.4) cannot be stressed enough, both on a technical and a "philosophical" point of view. Open Source as we know it would not exist were it not for a bunch of crazies at the University of Berkeley. 386BSD, the OS that never really was... Unfortunately, this book is not a printout of the "Porting UNIX to the 386" series published in Dr Dobbs magazine in 1991. It's mostly a commentary of low-level kernel code (mostly dealing with process management), which I must say I did not find particularly fascinating. 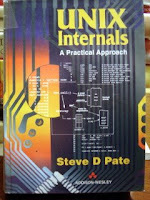 The best UNIX programming book I read, which covers UNIX concepts, system calls, the ANSI C library, etc. Tons of real-life code is also provided. 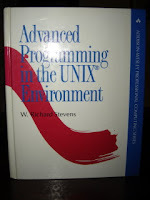 The late R. Stevens also wrote several other fantastic books on TCP/IP and network programming. He truly was a great technical author. Not UNIX but still a very good OS, so superior to Windows at the time (remember Windows 3.0???). 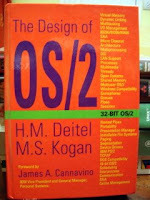 A dry but very serious book on designing a true multitasking OS for the i386. Still not UNIX, but getting closer. Microkernels helped redefine the architecture of traditional operating systems and Mach is probably the most widespread: a number of proper UNIces have been built over the Mach microkernel, from OSF/1 to MacOS X! - "Distributed communication services in the Masix system", Proceedings of the 15th International Conference on Computers and Communications, IEEE, Phoenix, pp 172-178, 1996. - "Secure Communication Services in the Masix Distributed Operating System", Proceedings of the IASTED, NETWORKS, Orlando, pp 5-9, 1996. Over 1000 pages of UNIX tips, tricks and wizardry. Command line tools, scripting, etc: this book has it all. I have the 1st edition, but the book has been revised several times and a lot of it still applies. 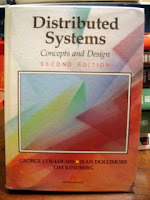 Lots of books have been written on distributed systems and this is simply the BEST (I have the 2nd edition, but a 4th edition has been published in 2005). It has the most complete and clearest descriptions of many complex distributed algorithms (clocks, transactions, etc). It also covers three microkernels used for UNIX-like distributed systems (Mach, Chorus & Amoeba). 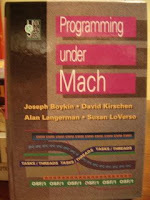 There was before and after this book, a true landmark in UNIX history. 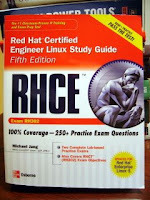 For the first time, this book revealed kernel-level information on SVR4, which was at the core of many commercial UNIces. 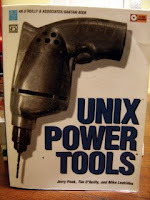 With accurate, up-to-date and crystal-clear descriptions of kernel data structures, algorithms and principles, this is maybe the best and most usable UNIX kernel book ever written. This isn't a technical book, but a detailed account of the early days told by the people who lived them. If you want to learn how it all started (and sometimes how it all went wrong), this is the book to read. And you also get to see pictures of all the Great Ancients, including Biff the Dog. Another very good kernel-level book, which covers all key areas (process management, IPC, filesystems, etc) as well some more exotic topics like distributed UNIX, NFS or kernel memory allocation (superb section!). The particular interest of this book is that all concepts are with several real-life examples taken from all major UNIces : 4.4BSD, SVR4, Solaris, etc. 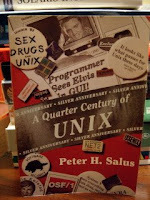 As far as I know, this was the first book to compare different UNIX versions in such detail. The New Testament, revised and updated for what is the last UNIX version released by the University of Berkeley. The book is quite verbose and sometimes obscure, but it is invaluable. 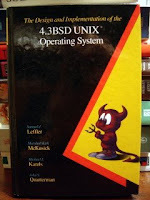 A lot of 4.4BSD code ended up in many UNIces, especially in Open Source versions like NetBSD, FreeBSD, OpenBSD and Linux. 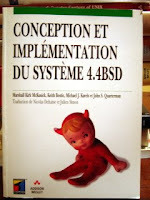 Conception et Implémentation du Système 4.4BSD, by K. McKusick, K. Bostic, M. Karels & J. Quaterman (published 1997). I loved that 4.4BSD book so much that I worked on the French translation... and I lived to regret it :) I think my English is quite good and my technical skills aren't too bad either, but try the section "explaining" virtual memory management on the VAX: this one alone almost made me quit! A slightly misleading title, as this book solely talks about SCO UNIX System 5 Release 3.2 for i386 architectures. A good kernel book, if you work(ed) on SCO UNIX or if you want(ed) to learn about a given UNIX implementation for the Intel architecture. 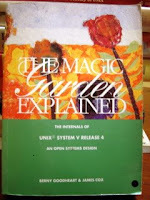 For my purposes, I found the scope a bit narrow and liked the "Magic Garden" book much better. And no, the "SCO vs the world" soap opera has nothing to do with it! 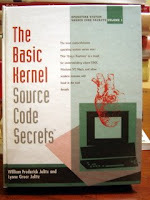 The first book on the Solaris kernel (2.5 to 2.7). I was working for Sun Microsystems at the time, so I particularly enjoyed it. Sun is good at writing documentation and although the content is highly technical, this book is an easy read, presenting complex kernel features in great detail. 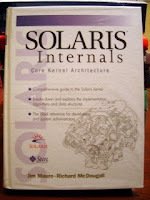 The same authors have since then written a Solaris 10 / OpenSolaris book which I have yet to read. - 4.4BSD Lite (1 CD, June '94): complete 4.4BSD Lite source distribution, with all AT&T files removed. This is where NetBSD, FreeBSD & OpenBSD come from. - BSDisc (1 CD, November '94): complete source & binaries for NetBSD 1.0 and FreeBSD 2.0. As far as I know, this was the first CD release for both OSes. - FreeBSD 2.0.5 (2 CDs, July '95): full distribution (sources & binaries) plus a live CD. - FreeBSD 2.2.5 (4 CDs, November '97): full distribution (sources & binaries), plus a live CD and a copy of the CVS repository. Wow, this has turned into a monster post... and I still have a few more books somewhere: where on Earth is that great book on Windows NT internals? Did I burn it? 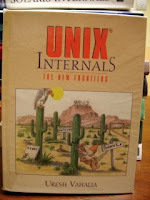 Not that I'm a big Unix lover (not at all in fact :) ), but this thread reveives some good ol' memories here!! Dude, I remember the incredible energy you put in your translations!!! Nevermind, if one day I decide to check on the linux side, I definitely use your link for a start.